We're only a little way into 2018, but the onset of new year has already got us excited for what promises to be a great season for film fans. With upcoming movies like Pacific Rim Uprising, Tomb Raider, and Solo: A Star Wars Story on the way, there's no better time to subscribe to our sister publication Total Film magazine, especially since MyFavouriteMagazine's ongoing sale can land you some big savings right now. You can get up to 55% off a subscription to the smarter film magazine, for as little as £29.99 a year. For that, you'll receive a brand new issue of Total Film delivered to your door every month, each one filled with exclusive coverage on all the movies you love, from interviews with the biggest Hollywood stars, to behind-the-scenes previews of upcoming blockbusters, and expert opinion on the latest films to hit the cinema. 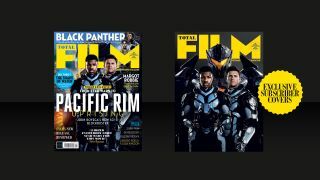 Get up to 55% off Total Film magazine: Subscribe from £8.40 and save up to 55% on a subscription with MyFavouriteMagazines. Just take a look at the new issue of Total Film - a Pacific Rim Uprising special, filled to the brim with everything you wanted to know about the monster-smashing sequel, on top of interviews with Chadwick Boseman, Guillermo del Toro, and Margot Robbie. Subscribing to Total Film also comes with its own unique benefits, including money saved with every single issue and an exclusive subscribers cover each month that you won’t be able to find anywhere else. Go on, treat yourself to a Total Film subscription while this amazing promotion lasts, and get closer to the movies you love for less.